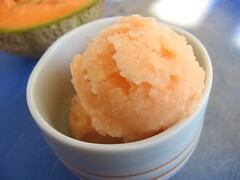 Charentais Melon Sorbet - Do You Know The Muffin Man? Notes: I saw some Charentais melons for sale from Thames River Melons at the Square One Farmer's Market last weekend. These melons are sometimes known as European canteloupes, smaller than their North American cousins. I was a bit disappointed however that they weren't all that sweet, nor were they more fragrant than regular canteloupe. They also looked nothing like the ones I see here. In any case, the sorbet had a nice melon flavour, granular texture (too much sugar maybe), and several tasters noted the alcohol (I used lime vodka instead of white port).